AMAC was founded in 1991 by Hitomi Ono for the Japanese musicians who would like to study and work on the music and their play further in the academic and healthy way. Please come into contact with AMAC directly by E-mail, if you have any question about lesson, course, or workshop of AMAC ! 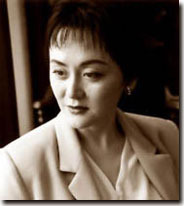 After the graduation of the Osaka College of Music (Voice), Hitomi Ono continued to study Voice with Jean Stawski and Donald Sulzen in Munich,Germany. At the same time she studied languages German at the Goethe Institiute and later Italian in the Maximilian University of Munich. She has studied intensively Voice with Elly Ameling, Rudolf Jansen, Sarah Walker, Roger Vignoles and others and Languages in Germany, Italy, France , England and USA for totally 11 years. In 1989 she started with having the lesson of the Alexander Technique in Munich with Tessa Codron and Inge Henderson,and In 1993 after 3 year training of the West Sussex Centre for the Alexander Technique with Adam Nott and Rosemary Nott, she became the first STAT( the Society of Teachers of the Alexander Technique) recognized Japanese Alexander Technique teacher. Body Mapping for Musicians. Since 2008 she is the President of the Andover Educators Japan. Since 1997 She teaches the Alexander Technique in the Soai University,Osaka. Also she gave many classes of the Alexander Technique for Musicians at Universities, Festivals and Conventions in Japan. In 2009 she taught the Alexander Technique in the Geneva Conservatory for 5 days with 4 introduction classes and many private lessons, Since then she teaches regularly in Geneva. In 2010 she teaches as the official Alexander Technique teacher of the Verbier Music Festival & Academy, Switzerland. She teaches in English, German, French and of course in Japanese. In 1991 She fonded AMAC corporation and gives for Musicians the opportunities and spaces to study and work as Executive Director.